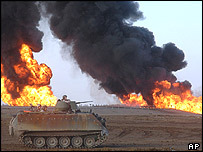 Attacks by insurgents on Iraq's oil industry cost the country $6.25bn (£3.6bn) in lost revenue during 2005, according to the Iraqi oil ministry. A total of 186 attacks were carried out on oil sites last year, claiming the lives of 47 engineers and 91 police and security guards, a spokesman said. Iraq's government has been struggling in the wake of a violent insurgency following the US-led invasion in 2003. US officials say the cost of rebuilding Iraq could reach more than $56bn. US Special Inspector-General Stuart Bowen earlier this month warned that Iraq's rebuilding was being undermined by continuing insurgent attacks. Most of attacks on Iraqi oil installations occurred in the north of the country, where crude is pumped through pipelines to the Turkish port of Ceyhan. "Iraq lost oil revenues worth $6.25bn in 2005 due to sabotage on the country's oil infrastructure," oil ministry spokesman Assem Jihad said. The attacks prevented Iraq from exporting about 400,000 barrels of oil a day, the ministry said. Iraq currently produces about two million barrels of oil a day, mostly from oil fields in the southern and northern tips of the country. However, that is down by about 800,000 barrels from production levels before Saddam Hussein's regime was toppled in 2003. Violent attacks on foreign contractors in Iraq have also hit the economy, pushing up security costs and delaying reconstruction projects.